Two new yachts are under construction as part of the Italian builder International Shipyards Ancona’s (ISA) new 500 series, which debuted with the launch of Liberty. While the three yachts are based on the same 49.9m technical platform, they will vary in superstructure and transom design. Andrea Vallicelli designed the steel and aluminium displacement yacht Liberty in collaboration with ISA’s in-house naval architects. Elegant, forward-sweeping lines, large windows on the main and bridge deck and a metallic-grey hull contrasting with a white superstructure define her exterior. Her sister ships will diverge in exterior styling; 500.2, to be delivered this summer, will have a modern, sporty style and will borrow the transom staircases found on the ISA 47m. It will feature a beach area accessed from the bathing platform via two large, curved glass doors. Hull 500.3 does away with the aft staircases that link each deck and has a slender, aggressive bow and clean lines similar to that found on the 60m and 63m ISAs. According to the builder, the sea was the inspiration for Liberty’s interior, designed by Stefania Biondo dalla Casapiccola of BDC Interior Design and Decor. She accommodates 12 guests in main-deck master, upper-deck VIP and four cabins on the lower deck. 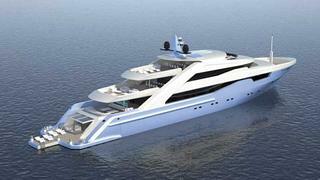 The 64m ISA 640, developed by Filippo Rossi, is in the design stages. It features ISA’s trademark aft staircases that connect each deck, from the beach club to the flybridge. The beach club includes a bar, space for a solarium and a retractable pier for tender and toy launching.